Pushing back against the idea that the Slave Power conspiracy was merely an ideological construction, Alice Elizabeth Malavasic argues that some southern politicians in the 1850s did indeed hold an inordinate amount of power in the antebellum Congress and used it to foster the interests of slavery. Malavasic focuses her argument on Senators David Rice Atchison of Missouri, Andrew Pickens Butler of… South Carolina, and Robert M. T. Hunter and James Murray Mason of Virginia, known by their contemporaries as the "e;F Street Mess"e; for the location of the house they shared. Unlike the earlier and better-known triumvirate of John C. Calhoun, Henry Clay, and Daniel Webster, the F Street Mess was a functioning oligarchy within the U.S. Senate whose power was based on shared ideology, institutional seniority, and personal friendship. 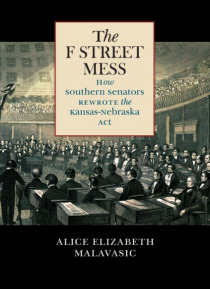 By centering on their most significant achievement--forcing a rewrite of the Nebraska bill that repealed the restriction against slavery above the 36 degrees 30 parallel--Malavasic demonstrates how the F Street Mess's mastery of the legislative process led to one of the most destructive pieces of legislation in United States history and helped pave the way to secession.